Every love story starts with a unique beginning. Whether it is an accidental meeting or a forced blind date, the beginning marks the start of how two people fall in love. In this case, after a busy work week and another late night ahead, Sahil wasn’t too eager about going to a wine tasting on December 6, 2014 but his friend gave him the extra push he needed to leave his house that morning. Little did he know, that was the magical day all the stars aligned and Sahil laid eyes on Natasha for the first time. After that night, he confessed to his friend that he couldn’t stop thinking about her. As their love story continued, the two faced many dragons and a few painfully awkward early dates but Sahil and Natasha kept fighting for their love until 1301 days later, they tied the knot and started their new beginning together as husband and wife. Enjoy this South Asian Wedding of Sahil and Natasha at the largest Sikh Temple in America, the San Jose Gurdwara Sahib. 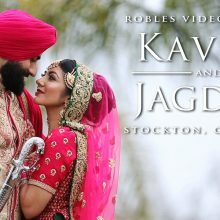 // The Sikh Indian Wedding in SAN JOSE GURDWARA SAHIB // Natasha and Sahil’s 5-day Sikh wedding celebration in San Jose was filled with cultural traditions, emotional speeches, and fun dancing that were all so exciting to film. It started with a day of henna artwork, which is always so cool to film as the mehndi artist, Netta Sharma, works her way up the bride’s arms and hands in mesmerizing patterns. This time, I tried out a time lapse approach and it worked out really well. The following day, all the guests joined in the Sangeet at Castlewood Country Club, which was full of laughter, dancing, and also included a skit about the couple’s love story. Family and friends were eager to share inside jokes and long forgotten memories about the couple. On the third day, we filmed as the bride’s face was covered in Haldi, a yellow turmeric paste. We were able to really get some amazing and closeup shots that gave that sequence in the final edit a very graceful and traditional look. These are some of my favorite shots from the whole film. The next day, the fourth day, was finally the wedding ceremony. Sahil and Natasha’s wedding took place at the largest Sikh temple in America – San Jose Gurdwara Sahib Temple. All the previous events were leading up to that day and all the details were finely coordinated to commemorate the Anand Karaj. The groom launched off the ceremony when he arrived on a white horse for that baraat. The tone of the wedding shifted to more serious as the couple partook in the Anand Karaj. Even the architecture of the San Jose Gurdwara enhanced the cultural feel of the wedding day. It provided a surreal backdrop to all the cultural details of the ceremony, which me and my Indian wedding videography team was able to closely film as they occurred. In addition, we were able to film the beautiful overview of this famous temple with our DJI Inspire 1 drone, giving this wedding film an epic bird’s eye view of the wedding scenery. After the ceremony, we were able to sneak away with the couple to the side of the Gurdwara and film some creative shots between the famous white pillars of the temple. After our quick 15 minute photo and video shoot, we headed down to the front of the temple for the emotion-packed vidaai. This moment is symbolically marked by a heartfelt goodbye as the bride leaves her family to join the groom, and they drive off together. And finally, the last day was the grand reception of the wedding at the San Jose Fairmont. The San Jose Fairmont is an elegant and gorgeous wedding venue that is simply stunning (to say the least) to have a South Asian wedding like this at. To add to that, the beautifully designed decorations, by Norma from Norma’s Flower Shop, and day-of coordination, by Minoti Mehta from Vermilion Weddings presented an unforgettable celebration. From the grand entrance, to the couple’s first dance (view it here: https://www.youtube.com/watch?v=ehkKt… ) and finally to the crazy Indian dancing, the reception program was such a thrill to film. During the reception, the groomsmen performed a choreographed dance for the guests (you can view it here: https://www.youtube.com/watch?v=Nemks… ), and out of nowhere the groom tore off his jacket and joined the dancers in his suspenders and “silly dance moves,” firing up the crowd. Toward the end, the groom jumped up to Natasha and pulled her to the middle of the dance floor, officially kicking off the dancing for the night. It was evident that the wedding guests enjoyed themselves as they danced the night away.